Comfort Inn hotels provide affordable accommodation in the most popular and convenient locations. As it is our mission to provide everyone with easy access to cheap and comfortable hotels, we’ve decided to find and list all the Comfort Inn hotels. Whether you’re travelling for business, leisure or in any other purpose, we’re sure that Comfort Inn hotels won’t let anyone down. To make sure that your accommodation leaves absolutely nothing to be desired, we’ve found only the best value offers. By booking your Comfort Inn hotel here, you’re guaranteed both an impeccable quality of service and the best price for your accommodation! 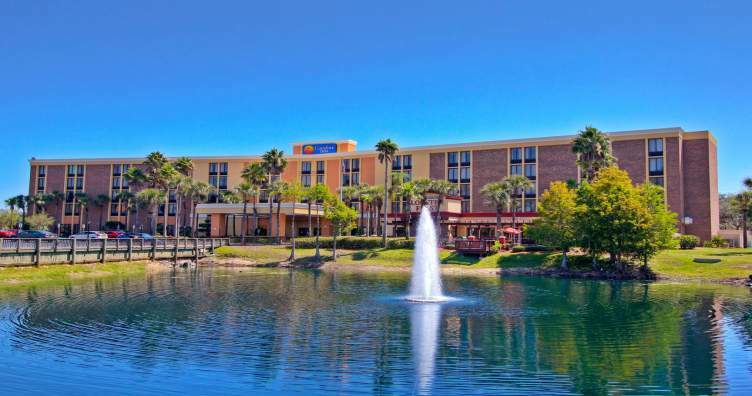 Comfort Inn Kissimmee is a 3-star hotel located in Orlando. This cheap hotel offers an excellent location close to SeaWorld Orlando, Walt Disney World and Walt Disney World Resort, as well as a range of comfortable facilities. Guests of Comfort Inn Kissimmee can enjoy the availability of complimentary wireless internet access, a Jacuzzi and an outdoor swimming pool. Every room at Comfort Inn Kissimmee is air-conditioned and equipped with a hairdryer, a TV and a private bathroom. Every morning guests of this hotel can enjoy a fresh buffet breakfast. Other dining options can be found in the area surrounding Comfort Inn Kissimmee. Orlando International Airport can be reached with a quick, 30-minute car drive. Comfort Inn Victoria provides 3-star accommodation in London. In addition to a 24-hour business center and wake-up service, this hotel offers complimentary wireless internet access, a 24-hour reception desk and a safe. Each room at Comfort Inn Victoria is conveniently fitted with all the essentials to guarantee a pleasant stay, including bottled water, an in-room safe, a private bathroom and a flat-screen TV. Air-conditioning is available in every room as well. Comfort Inn Victoria is located close to Victoria Coach Station, which makes it an excellent base for exploring the rest of London. Other points of interest nearby include Buckingham Palace, Westminster Cathedral and London Victoria Railway Station. 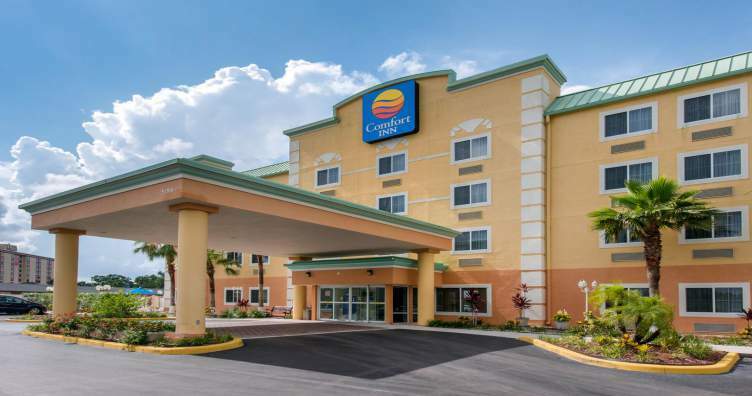 Located in Orlando, Comfort Inn Maingate is a 3-star hotel which offers an express check-in/check-out service, a kids pool, 24-hour room service and a golf course. 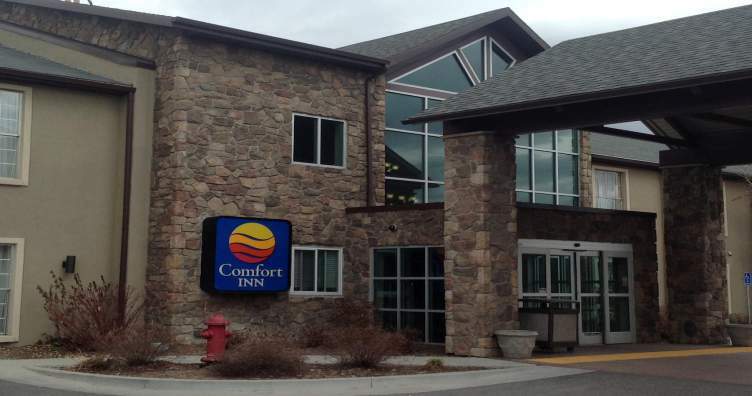 Other amenities at Comfort Inn Maingate include an outdoor, heated swimming pool, free shuttle service and a tour desk. Each of the 197 room at Comfort Inn Maingate is equipped with a private bathroom, air-conditioning, a flat-screen TV with both cable and satellite channels as well as ironing facilities. Comfort Inn Maingate offers diverse dining options which include both a restaurant and a bar, where guests can enjoy tasty meals and quality drinks. The location of Comfort Inn Maingate is another asset of this hotel, with SeaWorld Orlando, Magic Kingdom Park and Disney’s Animal kingdom located within short driving distance. Conveniently situated in Santa Monica, Comfort Inn Santa Monica West Los Angeles offers a range of comfortable facilities and low prices. In addition to an outdoor swimming pool, guests of Comfort Inn Santa Monica West Los Angeles can also enjoy the availability of a fitness center, a 24-hour reception, complimentary wireless internet access and a concierge. 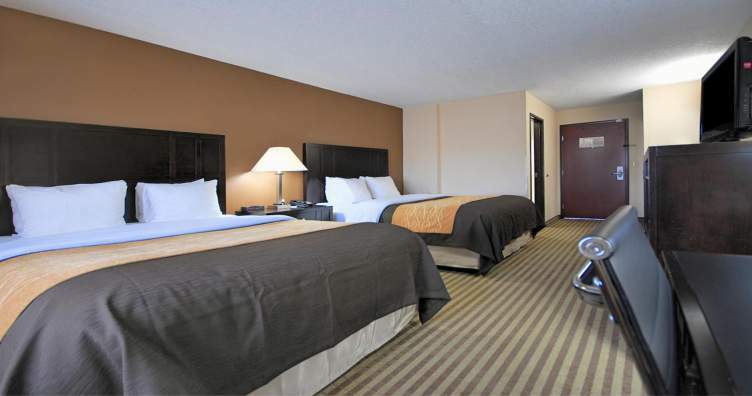 There are 56 spacious rooms to choose from at Comfort Inn Santa Monica West Los Angeles. Every room offers tea and coffee making facilities as well as a TV with cable and satellite channels and a private bathroom. 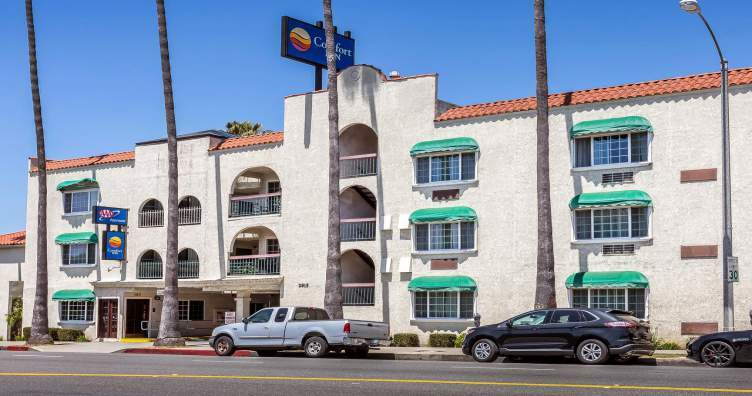 An on-site restaurant is also available at Comfort Inn Santa Monica West Los Angeles, providing guests with a convenient place to enjoy a meal. Comfort Inn Santa Monica West Los Angeles is located close to the Santa Monica Museum of Art. 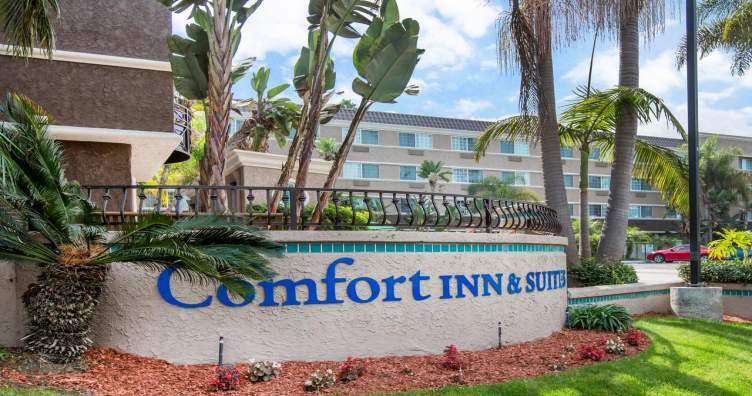 Offering easy access to the nearby San Diego International Airport, Comfort Inn & Suites Zoo / SeaWorld Area is a 2-star hotel which features complimentary wireless internet access, an outdoor swimming pool and an express check-in/check-out feature. Furthermore, this hotel has 24-hour staff assistance, a tour desk and room service. Comfort Inn & Suites Zoo / SeaWorld Area features modern, spacious rooms equipped with refrigerators, tea and coffee making facilities, wireless internet access and air-conditioning. An in-house restaurant, Hunter’s Steakhouse, is available at this hotel. Comfort Inn & Suites Zoo / SeaWorld Area is located close to SeaWorld San Diego, San Diego Zoo and Balboa Park. 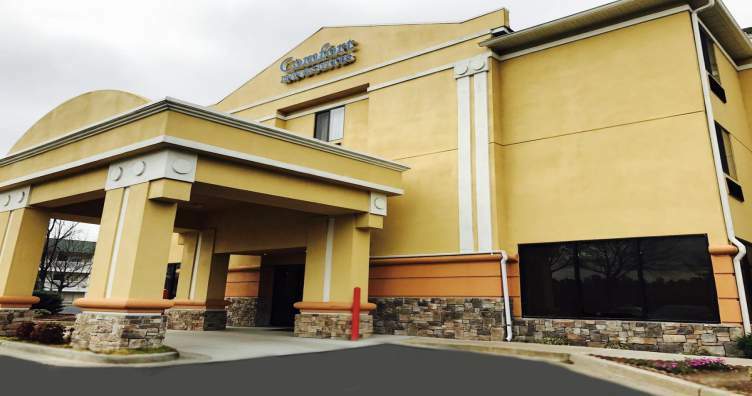 Boasting an indoor swimming pool, a Jacuzzi and easy access to the nearby Nashville International Airport, Comfort Inn & Suites Antioch is a 3-star hotel located in Nashville. Guests of Comfort Inn & Suites Antioch can also enjoy complimentary wireless internet access, an express check-in/check-out feature, an on-site fitness room and meeting rooms. 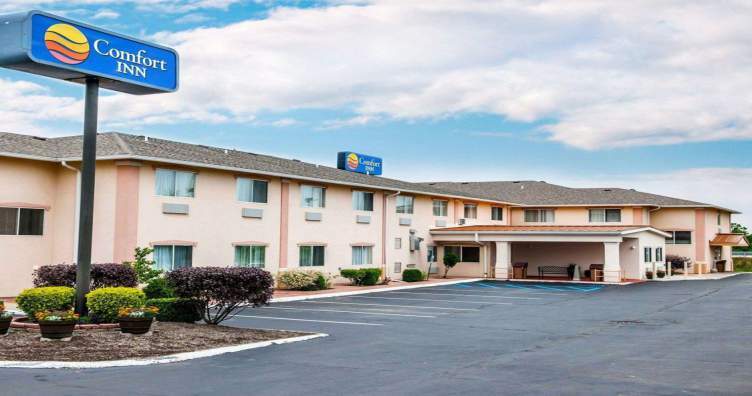 Each room at Comfort Inn & Suites Antioch is air-conditioned and equipped with a flat-screen TV with cable and satellite channels, a refrigerator, a private bathroom and all the essentials to ensure a satisfying stay. Comfort Inn & Suites Antioch is located close to Hickory Hollow Mall and Vanderbilt University. 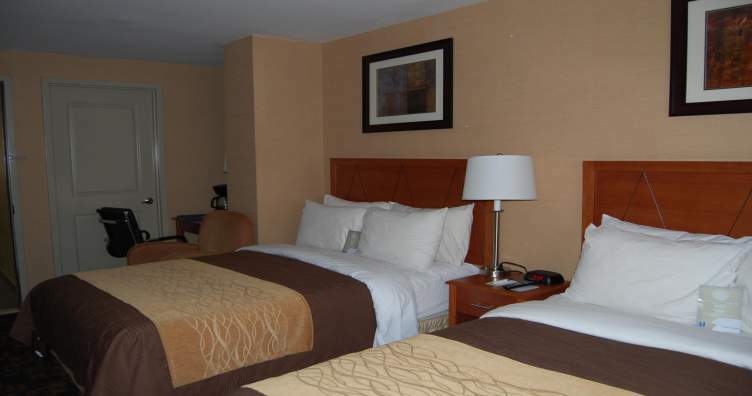 Comfort Inn Boston combines low prices with excellent quality of service. This cheap, 3-star hotel in Boston features complimentary wireless internet access, an outdoor swimming pool, a kids club and a free shuttle service. Other amenities at Comfort Inn Boston include an express check-in/check-out service, 24-hour staff assistance, a tour desk and meeting rooms. 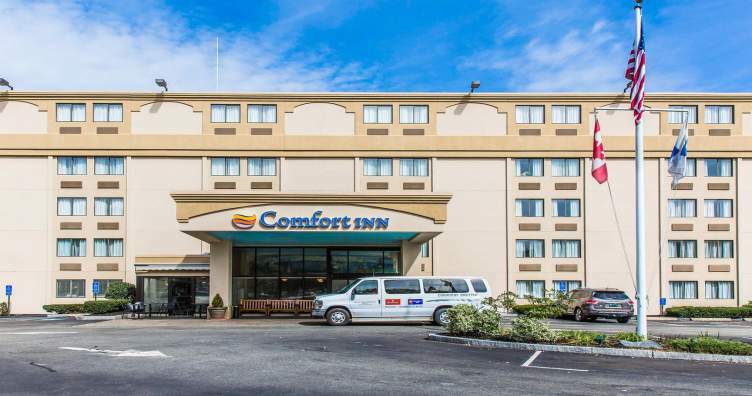 Guests of Comfort Inn Boston can choose from 132 modern rooms, each equipped with air-conditioning, a private bathroom, a TV and other necessities. For increased guests’ comfort, Comfort Inn Boston offers an on-site restaurant and a lounge bar. Comfort Inn Boston is located close to Port of Boston, Back Bay and Boston Commons. Those in need of cheap accommodation in Toronto will be delighted with what Comfort Inn Toronto City Centre has to offer. This 1-star hotel features complimentary wireless internet access, a fitness center and a tour desk. Additionally, guests of Comfort Inn Toronto City Centre can enjoy 24-hour reception, currency exchange, a multilingual staff service, laundry service and an elevator. Each of the 48 rooms at Comfort Inn Toronto City Centre offers a TV, a private bathroom and air-conditioning. The location of Comfort Inn Toronto City Centre is another asset of this cheap hotel in Toronto – guests can visit the nearby Toronto Eaton Centre, Old City Hall and Yonge-Dundas Square. 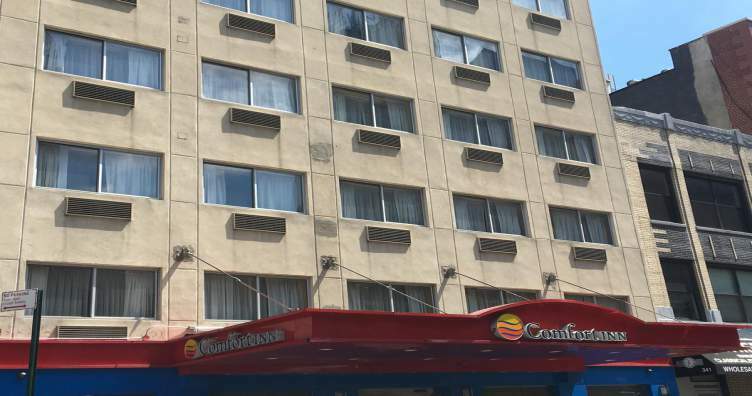 Comfort Inn Manhattan Bridge is a 3-star hotel located in New York City. In addition to complimentary wireless internet access, this hotel offers an excellent location close to the best tourist attractions in the city, as well as an executive floor, an express check-in/check-out feature and a playground. Every room at Comfort Inn Manhattan Bridge offers a private bathroom, a flat-screen TV, air-conditioning, an in-room safe and all the other essentials which guarantee the satisfaction of even the most demanding guests. Dining options at Comfort Inn Manhattan Bridge include both an on-site restaurant and a lounge bar. Other dining options can be found in the surrounding area. This hotel is located close to Downtown Community Television Center and Canal Street, as well as Manhattan Municipal Building. 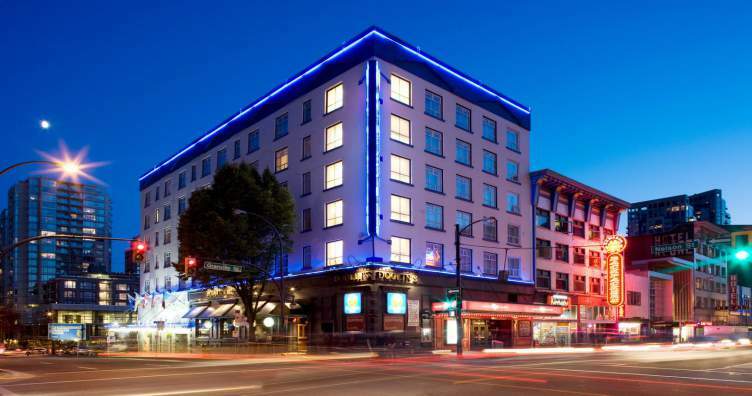 Providing cheap accommodation in Vancouver, Comfort Inn Downtown Vancouver is the place to go when looking for an affordable yet comfortable hotel. In addition to the complimentary wireless internet, Comfort Inn Downtown Vancouver offers an express check-in/check-out feature as well as luggage storage, a fitness center, a casino, a business center and room service. Comfort Inn Downtown Vancouver offers modern, spacious rooms equipped with private bathrooms, air-conditioning, TVs and all the necessities to ensure a pleasant stay. This hotel has an in-house restaurant, which serves a wide choice of quality meals. Comfort Inn Downtown Vancouver is located close to Vancouver Art Gallery and the Vancouver Public Library. 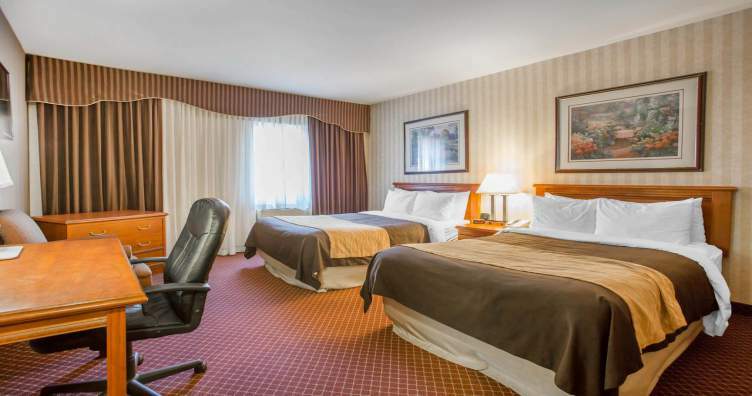 Comfort Inn Downtown DC/Convention Center is a 2-star hotel located in Washington D.C. which provides modern accommodation at an affordable price. 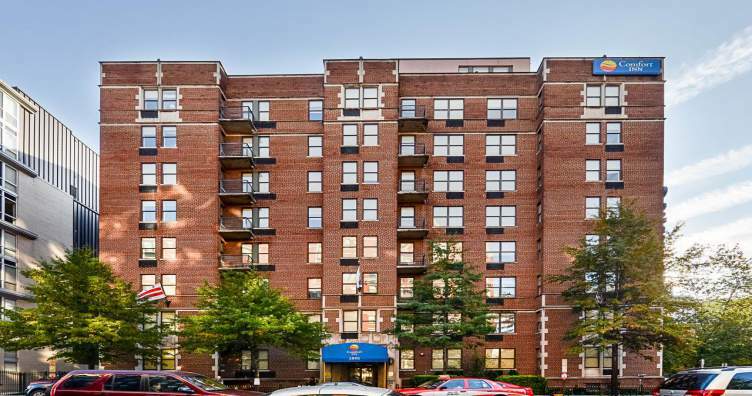 Guests of Comfort Inn Downtown DC/Convention Center can enjoy the availability of complimentary wireless internet and excellent location close to a range of clubs, restaurants and bars. Other amenities at Comfort Inn Downtown DC/Convention Center include a 24-hour reception desk, an express check-in/check-out feature and a business center. A fitness center with a gym is also located at this hotel. Every room at Comfort Inn Downtown DC/Convention Center is air-conditioned and equipped with a TV and a private bathroom. Comfort Inn Downtown DC/Convention Center is located close to Walter E. Washington Convention Center. Conveniently situated in New York City, Comfort Inn Times Square West offers complimentary wireless internet access, a 24-hour business center and a safe. Additionally, this hotel has a business center, an elevator, a wake-up service and laundry service. Each room at Comfort Inn Times Square West features a private bathroom, air-conditioning, a TV with cable/satellite channels and other essentials which guarantee a satisfying stay. For the increased comfort of its guests, Comfort Inn Times Square West offers an in-house restaurant. Comfort Inn Times Square West is located close to a range of attractions and points of interest, including the New York Public Library, Bryant Park and Rockefeller Center. 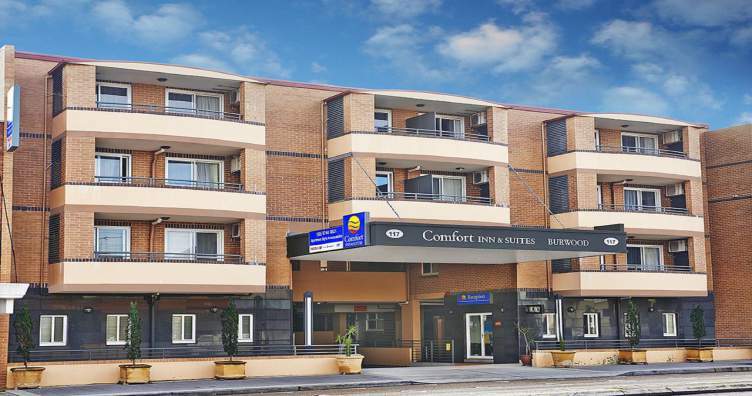 Comfort Inn & Suites Burwood Sydney is a 4-star hotel located in Sydney, Australia. In addition to a private parking lot, 24-hour staff assistance and a tour desk, this quality hotel features room service, a restaurant and an elevator. Other amenities at Comfort Inn & Suites Burwood Sydney include multilingual staff, a wake-up service, meeting rooms and luggage storage. 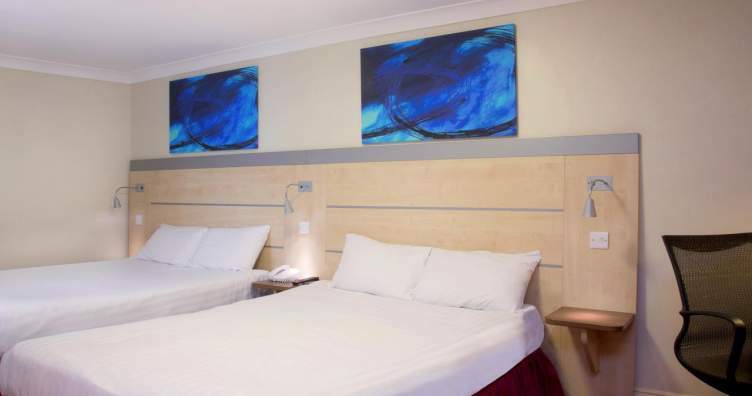 Guests of Comfort Inn & Suites Burwood Sydney can choose from spacious, air-conditioned rooms, all equipped with flat-screen TVs with both cable and satellite channels, private bathrooms, refrigerators and minibars. Dining options at Comfort Inn & Suites Burwood Sydney include a restaurant, Zeina’s Licensed Café, which serves quality meals. This hotel is located just 25-minutes of a car drive from Sydney Airport. 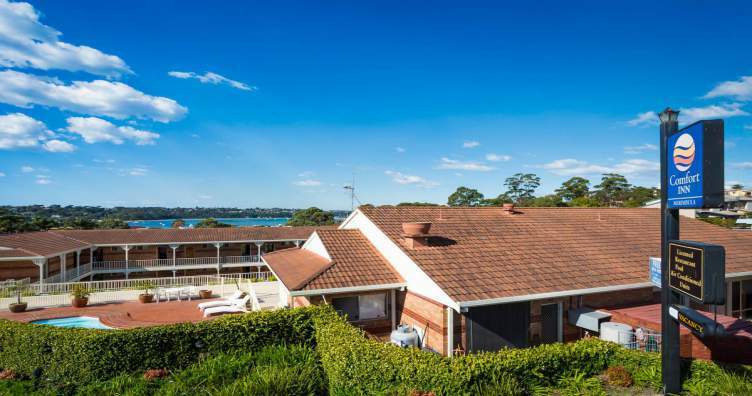 Comfort Inn Merimbula provides 4.5-star accommodation in Merimbula, Australia. Guests of this comfortable hotel gain access to meeting rooms, massage services, an outdoor swimming pool and room service. Furthermore, this hotel has a business center, a tour desk, 24-hour reception and babysitting services. Comfort Inn Merimbula has air-conditioned, modern rooms, all equipped with ironing facilities, complimentary wireless internet access, CD players and refrigerators. Additionally, this hotel offers an in-house restaurant which serves a range of tasty meals, and is open for breakfast every morning. A lounge bar is also available. Comfort Inn Merimbula is located close to Magic Mountain. If you’re looking for affordable accommodation in Dubai, you’re going to fall in love with Comfort Inn Hotel Dubai. This 3-star hotel offers complimentary wireless internet access, free shuttle service, free private parking and a range of other amenities. Guests of Comfort Inn Hotel Dubai can also enjoy the availability of an express check-in/check-out service, a business center, a beauty center, a Jacuzzi and multilingual staff assistance. All 113 rooms at Comfort Inn Hotel Dubai offer air-conditioning, a private bathroom, a flat-screen TV and other necessities. Dining options at Comfort Inn Hotel Dubai include Ahlanmulticuisine Restaurant and The Pool and Terrace Multicuisine Restaurant. 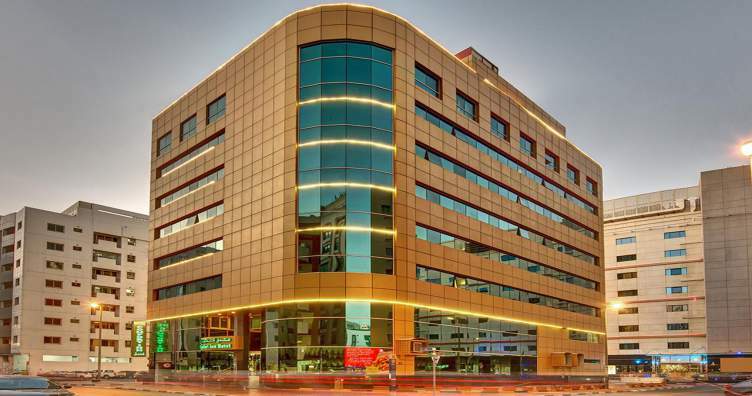 Comfort Inn Hotel Dubai is located close to Dubai Creek and Burj Khalifa. Comfort Inn London – Westminster is a 3-star hotel located in London, close to Victoria Coat Station. If you’re looking for a cheap hotel in London, you will be delighted with what this hotel has to offer. In addition to excellent location, Comfort Inn London – Westminster features a 24-hour reception, luggage storage and a business center. 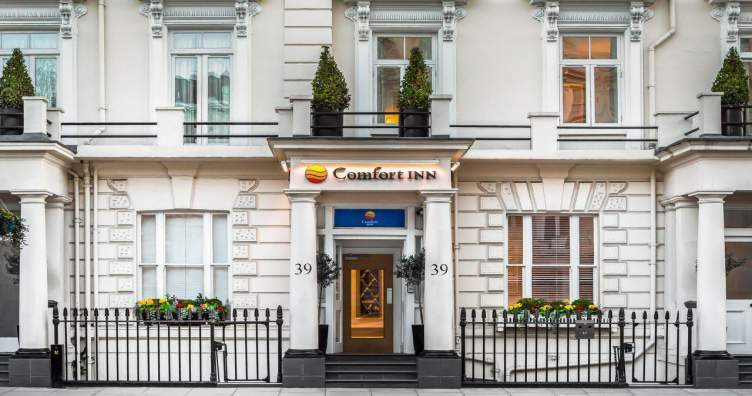 An ice machine and a lift are available at Comfort Inn London – Westminster. This hotel offers modern, air-conditioned rooms equipped with all the basic hotel essentials, which include TVs, private bathrooms, bed linen and telephones. Guests are welcome to dine and drink at the on-site restaurant and a bar. Fresh breakfast is available every morning. Comfort Inn London – Westminster is located close to Tate Britain, the Vauxhall Bridge and John Lewis Department Store. Those looking for cheap accommodation in Atlanta will be swept off their feet with what Comfort Inn & Suites Galleria has to offer. This quality hotel features a gym, an indoor swimming pool, complimentary wireless internet access as well as other amenities which guarantee the satisfaction of even the most demanding guests. Comfort Inn & Suites Galleria has modern, heated rooms equipped with private bathrooms, telephones ironing facilities and refrigerators. Comfort Inn & Suites Galleria is located close to a range of quality dining options, with various restaurants and cafes present in the surrounding area. Other attractions and points of interest nearby include Six Flags Over Georgie Theme Park, the World of Coca-Cola and Georgia Aquarium. 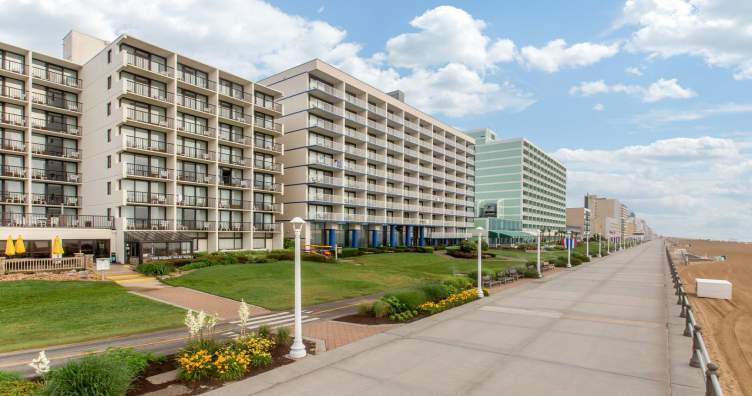 Located in Virginia Beach, Comfort Inn & Suites Oceanfront is a 3-star hotel which offers an indoor swimming pool, a gym and complimentary wireless internet access. Other amenities at Comfort Inn & Suites Oceanfront include concierge, an elevator, a 24-hour reception desk, dry cleaning service and an express check-in/check-out feature. Guests can choose from 83 rooms, all equipped with a TV, air-conditioning, a private bathroom and other necessities. This hotel also features an on-site restaurant, which serves a wide choice of tasty and healthy meals. Other dining options can be found nearby. 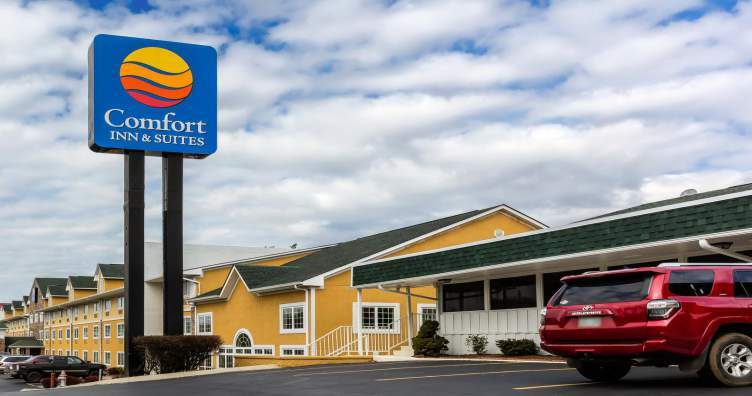 Comfort Inn & Suites Oceanfront is located within an easy walking distance from Virginia Beach Boardwalk as well as the Old Coast Guard Station Museum. 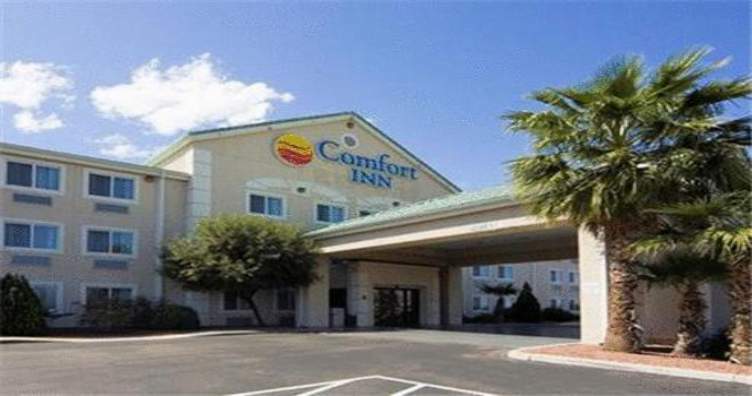 Comfort Inn Tucson is a 2.5-star hotel located in Tucson, Arizona. In addition to an outdoor swimming pool and a sauna, this hotel offers an excellent location close to the University of Arizona and Presidio San Agustin del Tucson. Guests of Comfort Inn Tucson can also enjoy the presence of a 24-hour reception desk, a fitness center, complimentary wireless internet access and a BBQ area. Each room at Comfort Inn Tucson is conveniently fitted with a kitchenette, a TV with movies on demand, tea and coffee making facilities and wireless internet access. Comfort Inn Tucson is conveniently located close to Old Tucson Studios, Tucson International Airport and Tucson Convention Center. 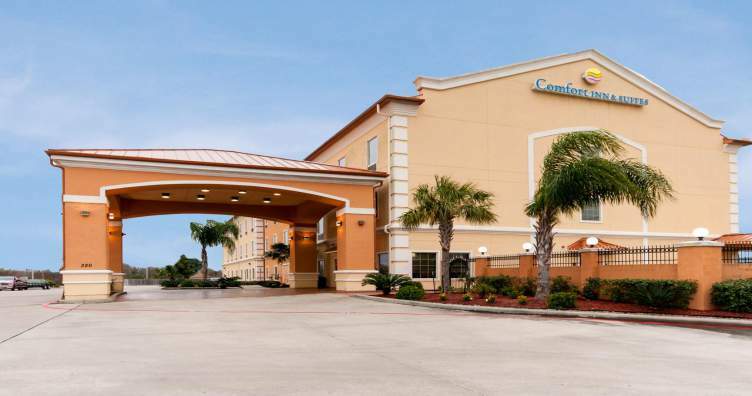 Comfort Inn & Suites Texas City is a 3.5-star hotel location in Texas City. In addition to complimentary wireless internet access, a golf course and an outdoor swimming pool, guests of this affordable hotel can enjoy the availability of a fitness center and a 24-hour reception desk. Other amenities at Comfort Inn & Suites Texas City include an express check-in/check-out service, safe-deposit box and a business center. Comfort Inn & Suites Texas City has modern, air-conditioned rooms equipped with private bathrooms, wireless internet access and all the other essentials which ensure a comfortable stay. Comfort Inn & Suites Texas City features an on-site restaurant which offers a wide range of healthy meals. Comfort Inn & Suites Texas City is located just 40 minutes of a car drive from William P Hobby Airport. Comfort Inn South – Springfield is a perfect choice for a hotel in Springfield for anyone who is in need of cheap accommodation. This hotel offers an express check-in/check-out feature as well as a 24-hour business center, a heated swimming pool and complimentary wireless internet access. Other amenities at Comfort Inn South – Springfield include a fitness room, a lift and laundry service. This hotel features modern, air-conditioned rooms all equipped with tea and coffee making facilities as well as TVs with cable and satellite channels. 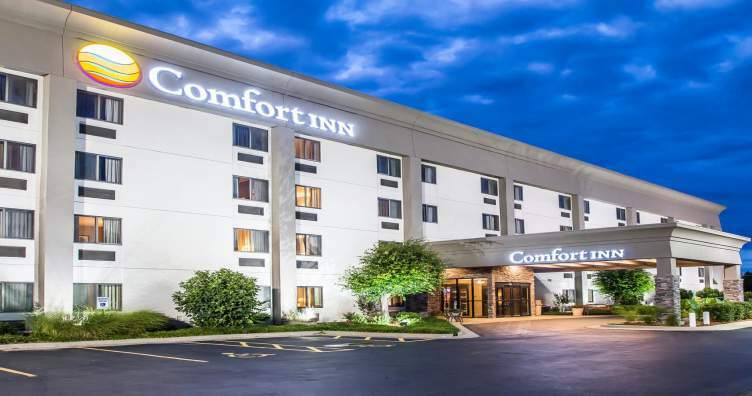 Comfort Inn South – Springfield is located close to a range of restaurants and interesting attractions, such as Pythian Home of Missouri and the Wonders of Wildlife Museum & Aquarium. Featuring a concierge, meeting rooms, 24-hour reception and a Jacuzzi, Comfort Inn & Suites Seattle is a 3-star hotel located in Seattle, close to Seattle-Tacoma International Airport. Guests of this comfortable hotel can enjoy a business center, a tour desk, an elevator and dry cleaning service. Comfort Inn & Suites Seattle features air-conditioned, modern rooms, all equipped with tea and coffee making facilities as well as private bathrooms. Another asset of Comfort Inn & Suites Seattle is the presence of an on-site restaurant which serves a wide range of tasty and healthy meals. Comfort Inn & Suites Seattle is located close to the Museum of Flight and Wizards of the Coast. Comfort Inn Downtown Salt Lake City is a 3-star hotel located in Salt Lake City. In addition to a swimming pool and a beauty center, Comfort Inn Downtown Salt Lake City features a fitness room, a garden, a business center and a tour desk. Other amenities at Comfort Inn Downtown Salt Lake City include a wake-up service and a luggage storage service. This hotel has air-conditioned, spacious rooms equipped with TVs and private bathrooms. Dining options at Comfort Inn Downtown Salt Lake City include an in-house restaurant, which provides guests with a convenient setting to enjoy a meal. Other dining options can be found nearby. Comfort Inn Downtown Salt Lake City is located close to the Salt Lake Public Library, Salt Palace Convention Center and Salt Lake City and County Building. Those in need of cheap accommodation in Richmond will be delighted with what Comfort Inn Richmond has to offer. This hotel features a 24-hour reception desk, laundry facilities, complimentary wireless internet access, a Jacuzzi and an indoor swimming pool. Furthermore, Comfort Inn Richmond offers spacious, comfortable rooms, all of which come conveniently fitted with a range of essentials to ensure the satisfaction of even the most demanding guests. An on-site restaurant is also available at Comfort Inn Richmond. This hotel is located close to a range of attractions and points of interest, including Abram Gaar House and Farm and Bethany Theological Seminary. Located in Portland, Comfort Inn Portland offers a range of 3-star facilities at an affordable price. Guests of this hotel can enjoy the availability of complimentary wireless internet access as well as a heated swimming pool and a golf course. There are 66 spacious rooms at Comfort Inn Portland, each equipped with a private bathroom, a TV and air-conditioning. 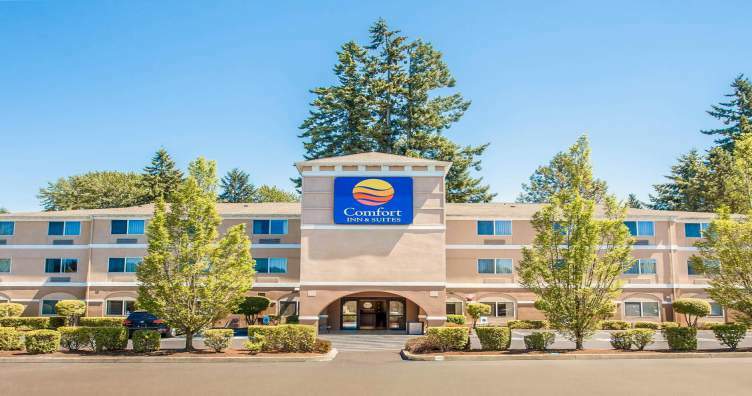 The location of Comfort Inn Portland is another asset of this cheap hotel, as Northeast 82nd Avenue Train Station can easily be reached on feet, which makes this hotel a great base for exploring the rest of the area. An on-site restaurant is also available at Comfort Inn Portland, where guests can sample local cuisine. Accommodation is what makes or breaks any trip, and that’s why you shouldn’t book just any random hotel. Comfort Inn hotels are backed by years of tradition and thousands of satisfied clients. This ensures that by choosing Comfort Inn hotels as your source of accommodation, you can rest assured that you won’t encounter any unexpected troubles or problems. Here you can find all the best Comfort Inn Hotel deals, and effortlessly book one that you like online. By reviewing and comparing our hotel deals every day, we give you the certainty that our deals offer you the best value for your money. It also guarantees that they are all available and ready to be booked – as we value your time, we work hard to make sure that all of our offers are up-to-date. Say goodbye to accommodation nightmares which are the result of choosing a random hotel. By choosing a Comfort Inn hotel, you know exactly what to expect. Additionally, from now on, you don’t have to waste time looking for your accommodation all over the internet – all the best Comfort Inn hotels are always readily available here. Let professionals handle your accommodation, and just enjoy your trip!